You know the drill you do your makeup first thing and it's looking all nice and fresh but roll on 3 o'clock and you're looking less fresh and more mess. Well in my case that's true, my t-zone gets super shiny, my foundation looks patchy - until I tried this trio of products and it was hello fresh face all day, seriously I had this face on for over 10 hours last week and I was still rocking my makeup! I'm pretty lazy when it comes to primers but it really is the secret ingredient to creating a smooth base for your foundation. I've used Benefit's Porefessional and Maybelline Instant Pore Eraser but not keen on the silicon effect. Laura Mercier Oil Free Primer has been on my radar for ages and I'm glad I picked one up. This lightweight formula helps you to spread makeup evenly and effortlessly and is suitable for oily and acne prone skin. The texture is creamy like a moisturiser but once rubbed on the skin sinks in quickly and leaves a semi matte finish. I dab it on my t-zone and cheeks, I find I don't need to use a lot of product and it covers really well. A true test of a good primer is how well you can apply your foundation afterwards. Once I glided my foundation brush with Giorgio Armani Luminous Silk onto my skin, I knew it was a match made in heaven. It applied really smoothly over my skin, I already love this foundation (Giorgio Armani Luminous Silk review here) and paired with the primer it left my skin looking flawless. This foundation is medium to full coverage, 1 pump covers my face and the pump is really easy to control how much product you want. Worth the price tag in my eyes. I have oily skin and wouldn't last an hour without using a good setting powder! I've used Rimmel Stay Matte in the past but it just doesn't cut it for me. Soap and Glory One Heck Of A Blot is a translucent powder that keeps my skin shine free, without adding more colour. It comes in the standard S&G cute retro packaging, with a mirror and puff. 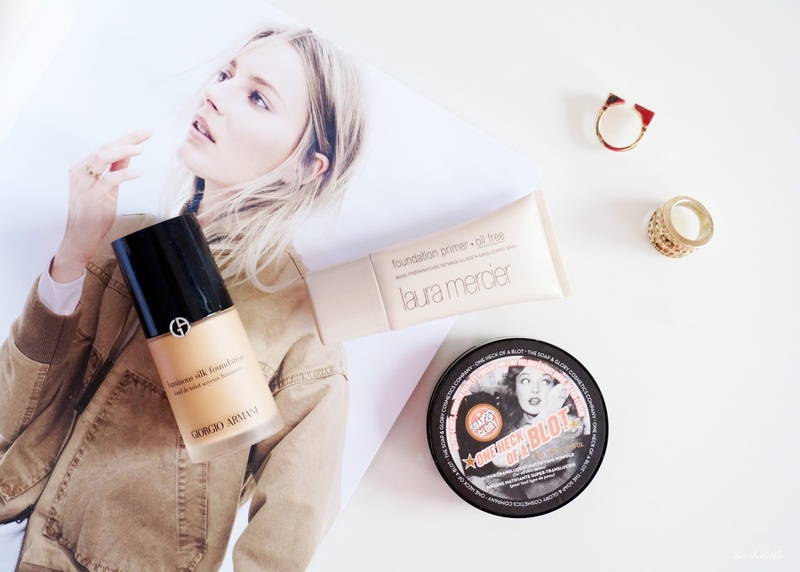 I rarely have to touch up during the day with this powder, but to apply first thing I like to use a Laura Mercier face sponge, I find it easier to control where the product goes on my skin and I can dab it easily around my nose and chin. The formula is lightweight, feels silky on the skin and doesn't leave a horrible cakey finish. It's not as glowy as the Laura Mercier Pressed Setting Powder but for £12, it does a great job at keeping my face shine free and makeup in check. What are your go to products to make your makeup last? I'm exactly the same, my skin just drinks up foundation so I have a similar sort of routine in place! Thanks hun! I know exactly what you mean about being lazy with primers but it really is the glue that holds my makeup together haha. Ohh that's annoying, maybe give your skin a light dusting on your t zone to control any shine? I hate putting powder all over as it takes away all the natural 'glow'! You've just reminded me how much I love my Luminous Silk - this time last year it was my absolute favourite, it has however been neglected! I am so curious about the LM primer now, I have yet to find a primer that didn't break me out but this one sounds fab! I might have to check the soap and glory powder. But I think soap and glory is bit more expensive here in states. I have only seen in it sephora. It's a great powder, fortunately it quite affordable over here. 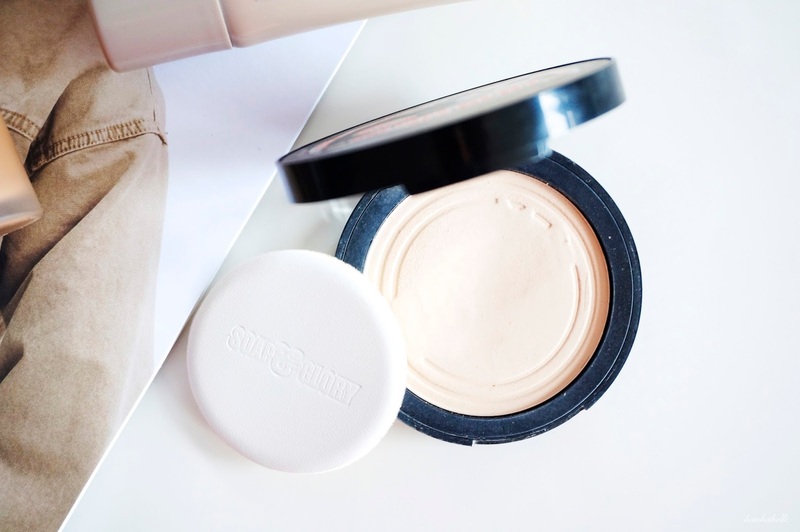 The S&G powder sounds so good and is perfect for throwing in your bag! I want them to extend their Australian stock so much, they currently only stock their bath products here. Really have to get better about using primer, it is a step I always shun. But I am pretty good at powdering my face to keep everything in place. I'm currently searching for the perfect primer. Porefessional doesn't really do anything for me. I want to try the Stila one. Have you tried that one? The LM Primer is fabulous! I've always preferred it and agree with you about the silicon affect of Benefit, although I haven't actually tried the Maybelline option. Thanks for sharing such a great post. So in love with the GA foundation!!! My skin is combination, so I have to apply a very thick primer with it, but I can't get over the finish. Will you be using this on your wedding day? ?